Division of Boating and Waterways Commission and Department of Pesticide Regulation discuss future of anti-fouling paints. SACRAMENTO — Strict regulations governing the use of copper on recreational boats are set to go into effect July 1, according to a Department of Pesticide Regulation (DPR) presentation to the Division of Boating and Waterways (DBW) Commission meeting in Sacramento on May 10. Aniela Burant, an environmental scientist with DPR, updated commissioners on a new California regulation – 3 CCR Sec. 6190 – on copper-based anti-fouling paints and coatings. The regulation states recreational boats cannot be registered with the state if they have a leach rate of 9.5 micrograms per square centimeter per day. High leach rate paints won’t be available for purchase from distributors or manufacturers beginning July 1, Burant added. Boatyards, however, have two years to sell their inventory of high leach rate paints. “The Department of Pesticide Regulation has regulatory authority over this because the copper in anti-fouling paints is considered a biocide, which is a pesticide,” Burant told commissioners. Burant added the new regulation would not apply to commercial vessels, such as passenger ferries, excursion boats, tugboats, fishing boats and military vessels. The regulation, however, does not require hull-cleaning management. “We have no jurisdiction or regulatory authority over [Best Management Practices] versus non-[Best Management Practices] cleaning, because it’s the discharge of a certain pesticide, not use or sale [we regulate],” Burant said. Boaters will still be able to use certain anti-fouling paints so long as they are registered under 3 CCR Sec. 6190. There are 91 permissible anti-fouling paint products listed within this regulation, according to Burant. Category 1 was last updated on July 20, 2017. Some paints mentioned during Burant’s presentation to commissioners included Vivid, Micron 66, BottomPro Gold and Micron Ultra. – The establishment of site-specific copper objectives for certain marinas and harbors. Paint manufacturers, according to Burant, must also be registered with DPR and submit new data to the agency if they fall into one of three categories: they introduce a new product; they amend their current registration (i.e., change paint color or active ingredient concentration); or, a registration is amended to allow the product to be used on recreational vessels. Both DPR staff and DBW commissioners expressed a concern of boaters obtaining bottom paints, in violation of California’s new regulations, from Mexico, Nevada or elsewhere out of state, Burant added. Commissioner Douglas Metz pressed Burant on the environmental need to regulate copper. “What is the environmental impact of copper as a biocide in marinas? What sort of lives are affected? Where is our environment impacted by having high concentrations of copper in a marina,” Metz asked Burant. The DPR scientist replied by stating copper is toxic to certain aquatic organisms toward the bottom of the food chain. Katherine Pettibone, the commission’s vice chair, asked why the impending regulation only focuses on recreational vessels (and, for now, exempts Commercial boats). Pettibone continued to question Burant as to why commercial vessels could not be included within the state’s new regulatory scheme, as a matter of addressing toxicity. “We found they are not causing the water quality issues as much as the recreational boats,” Burant responded. Nan Singhasemanon, who works in DPR’s Pesticide Programs Division, added the U.S. Navy did perform its own studies and found a high concentration of copper near the hulls of the big ships. He added copper levels would always be high within a few feet of a boat hull, regardless of boat type. DPR, instead, studies water samples in the main channel or away from marinas – and the data found there generally shows higher levels of copper emanating from recreational boats, Singhasemanon said. Burant added the state’s goal to reduce copper in its marinas is a long-term play and changes won’t happen overnight. Commission Chair Randy Short stated the discussion surrounding anti-fouling paints and copper concentrations in California’s waterways is a confusing issue with varying interests involved. We hope this article helped you in your decisions as to your boats hull and its maintenance. If you have any questions or concerns, please be sure to contact the team here at Armored Hull Boat Shields. 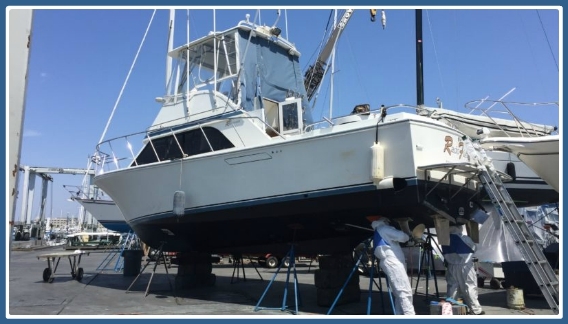 We are committed to providing you with the utmost in professional boat hull protection. Click on the Armored Hull Boat Shields logo below and contact us today!